On the afternoon of Thursday, 10-24-2013, I drove out by P&L’s West Yard between changing locations between Morton’s Gap and Madisonville. West Yard is located beside KY 70 about two miles west of downtown Madisonville on what IC termed the “New Line”. The original main line of their Paducah District ran west from Central City via Greenville to Dawson Springs. The “New Line” was constructed later and pierced the heart of the most productive Muhlenberg and Hopkins County coal areas around Madisonville. 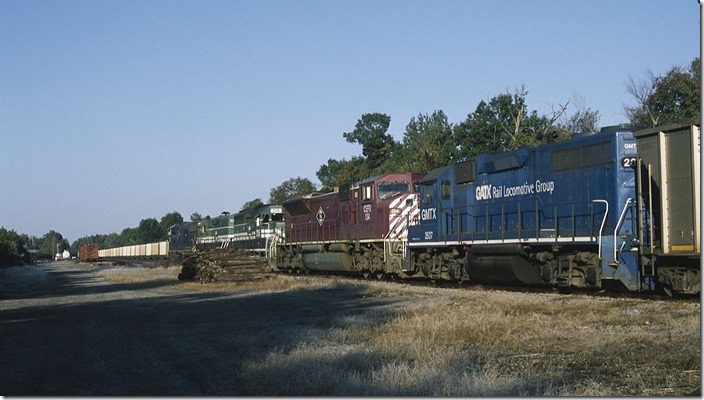 IC’s Creole and Irvin S. Cobb passenger trains used the old line through Greenville while the dispatch freights went via the New Line. IC and ICG’s engine terminals were located at Princeton and Central City. Princeton served mostly the Evansville-Henderson line, and P&L continues to base a local there, I believe. Central City was a much larger yard, serving as a crew change point for dispatch freights, a base for many mine runs and for weighing and classifying coal. West Yard had a train order office and trainmaster, but didn’t service locomotives. Today you will find engines parked at West Yard, but nothing at Central City. 1. 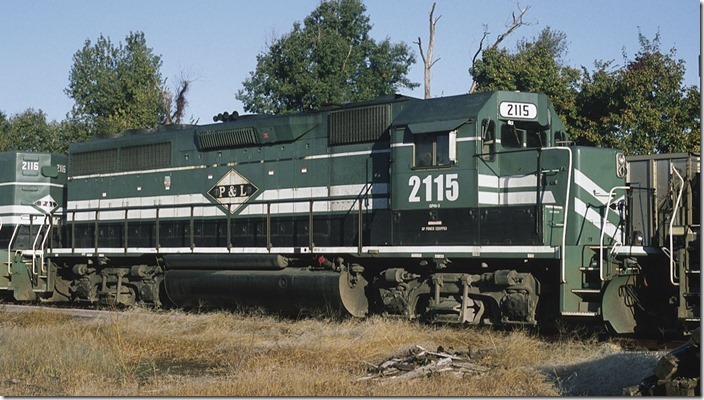 PAL 2107 and 2127 face the late afternoon sun at the west end of West Yard on 10-24-2013. 2. 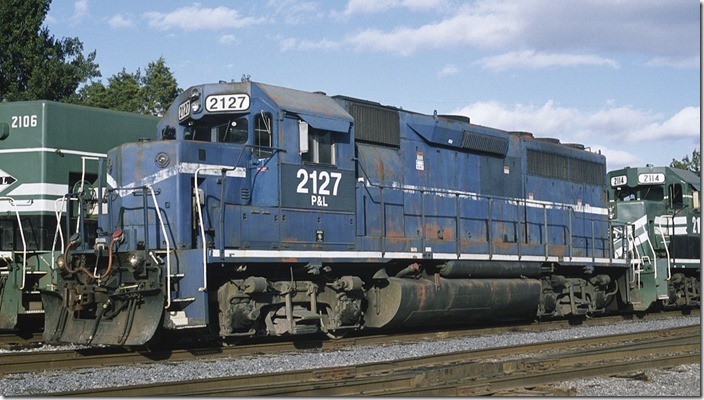 PAL “GP40-3” 2127 coupled to slug set 2114-2113. 3. PAL 2127 is ex-HLCX, exx-CR, exxx-PC nee-NYC. Paint me please!!! 4. On the morning of Friday, Oct. 25th, I cruised by West Yard again, but nothing was happening. GATX 2637-PAL 134-2115-2116-4522 await a crew for later in the day. 5. 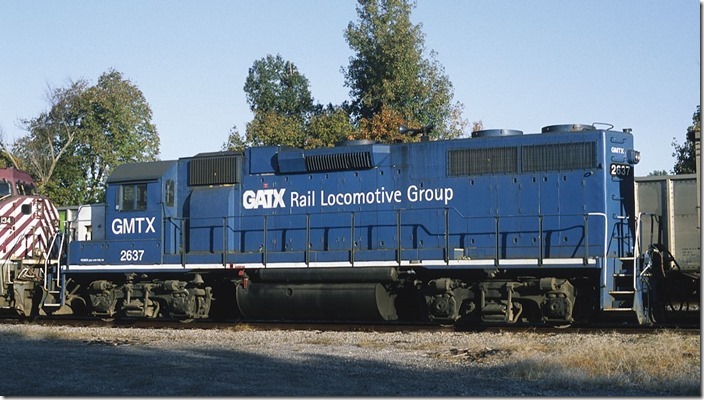 GMTX GP38-2 2637 is ex-CR, nee-PC. 6. CEFX SD90MAC 134 has had the loco changed from A&O (Allegheny & Ohio) to PAL. I presume it is still leased and not owned by P&L. 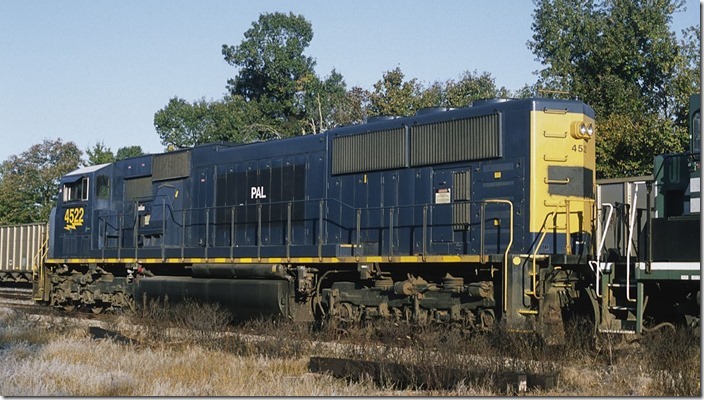 Chris Strogen wore the poor unit out when he was engineer on the A&O!!! He raved out what good units these were to work with!! 7. 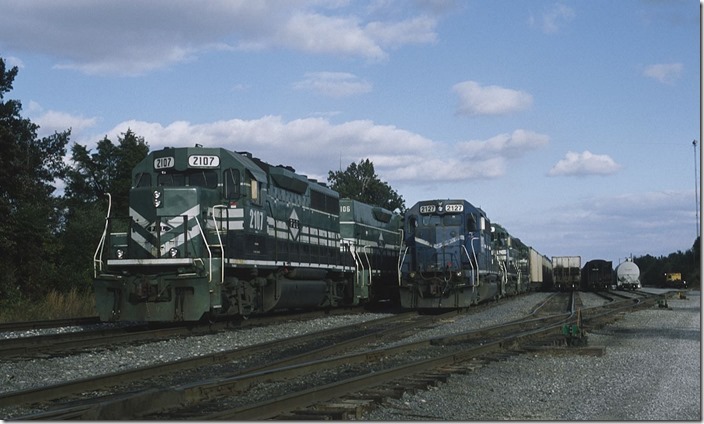 Now for some really modern and dependable EMD power. 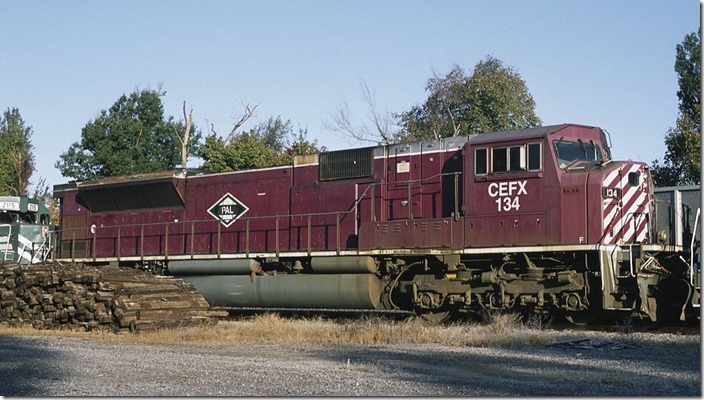 James Moore, Russ Miller, Dale Diacont, Jesse Smith, Tommy Clay, Bryan Pleasant and Donald Dunn are all probably crying their hearts out that CSX jumped at the opportunity to get rid of these classic engines. 8. I haven’t heard any complaints about the improved “GP40-3” slug mothers. 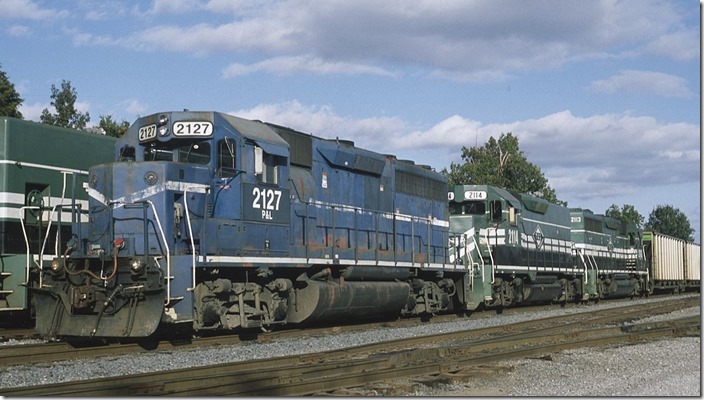 The 2115 wore the paint schemes of C&NW, CR, PC and NYC in its long life. Remember that P&L gave the mother units odd numbers and the road slugs even. 9. BUKX (Louisville Gas & Electric) rapid-discharge hopper 120896 has a load limit of 237,200 and a volume of 4200 cubic feet. 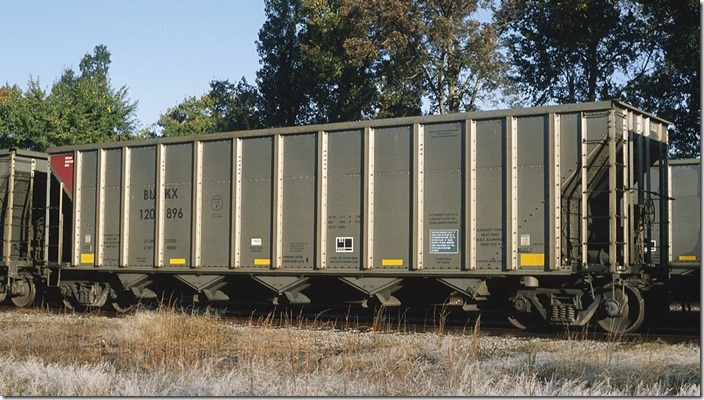 It was built by Freight Car America at their Roanoke, Va. shop in 5-07.